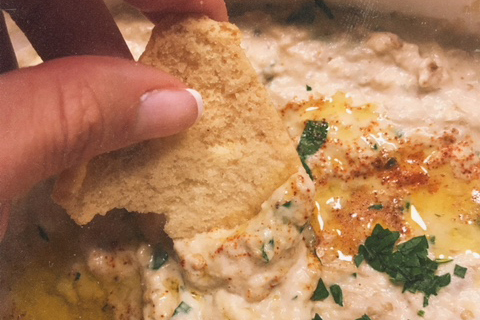 This roasted eggplant dip is baba ganoush inspired, and I say that because my addition of mayonnaise and roasted Korean sesame paste may be blasphemous to some, but those of you who know my cooking probably aren't surprised! It is tangy and filled with garlic, yet the nuttiness from the sesame seeds mellow it all out. I love serving this dip chilled with crunchy pita chips and sliced veggies. I must admit, I always hope for some leftovers, because it is an excellent sandwich spread for next day lunch wraps or on top of a grilled lamb burger. I will never experience flavor the way I did at a proper Middle Eastern restaurant, but can't a girl try to get as close as possible? Split eggplants in half, pierce with fork brush all over with evoo and season with salt + pepper. Place on a baking dish, flesh side down, and roast for 35-40 minutes. Once eggplant is roasted and cooled, scoop out flesh into a medium sized bowl. Using two fork, and immersion blender, or a food processor to break down any large chunks.